Home > Physicians > Paul V. Birinyi, M.D. Dr. Birinyi was born in Dallas, Texas and grew up in the surrounding suburbs. He then undertook a long educational odyssey to research and learn the neurosciences. Following training, Dr. Birinyi and his family relocated to Alexandria to bring his expertise gained from working at the National Institutes on Drug Abuse (NIDA), designing robotics and surgical navigation devices, and training under one of the founders of minimally invasive spinal surgery. In Alexandria, Dr. Birinyi enjoys providing the community and the wonderful people in the surrounding areas technologically advanced neurosurgery, the latest minimally invasive surgical techniques, and compassionate, comprehensive care. 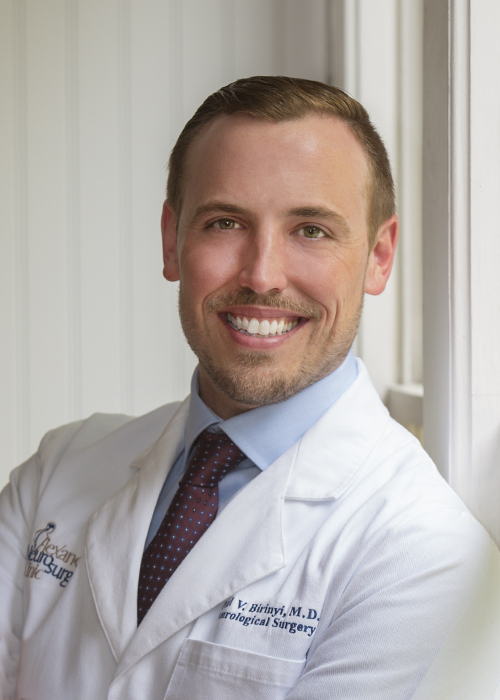 His philosophy is that the population of Central Louisiana deserves to have the best neurosurgical and spinal care in its own backyard. He also is committed to staying current with the latest neurosurgical techniques to continue to provide the best care possible. When not helping the people of Central Louisiana, Dr. Birinyi enjoys spending time in the community, being with his wife and daughters, and partaking in Louisiana's vast outdoorsman culture.